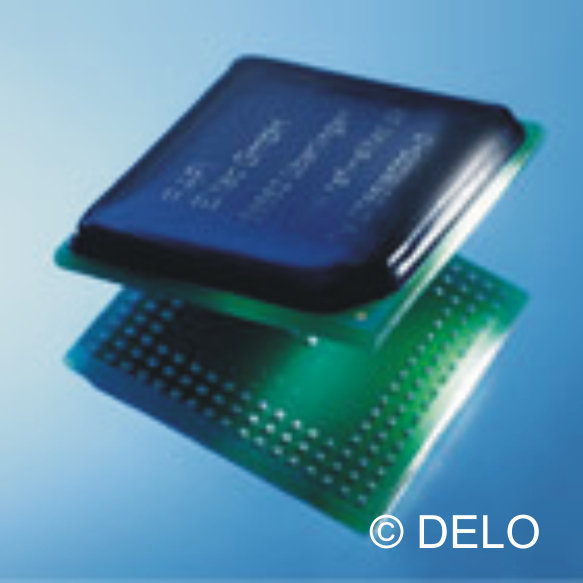 For Chip-On-Board (COB) applications, some form of protection is necessary for the bare silicon Integrated Circuit (IC) and its wire bonds. Typically, COB consists predominantly of surface-mount components, which by their very nature do not require any extra protection against environmental stresses. However, the bare silicon, and the wire bonds that connect the IC to the tracks on the PCB, are fragile by nature, and some form of protection is required. This is provided in the form of a hard black epoxy. For small ICs, a single process is sufficient to ensure this protection. The epoxy is dispensed onto the surface of the IC and flows in a controlled manner to form a dome over the IC and the wire bonds. Heat is then applied to cure the adhesive, forming a hard protective surface over the IC. However, larger ICs require a two-stage process: A high-viscosity epoxy is dispensed to form a wall, or Dam, around the area to be protected, and a chemically-compatible, lower-viscosity epoxy is then dispensed into the cavity to complete the protective covering. This process is known as Dam & Fill, and ideally the Dam and the Fill are cured simultaneously. In addition to mechanical protection, these epoxies provide excellent resistance to aggressive chemicals such as motor oil & diesel, aqueous, UV & solvent-based printing inks, and also vibration and temperature extremes. Typical applications include automotive electronic sensors, bio-medical device protection, aerospace and military mixed technology programs. The adhesives are one-part, solvent-free epoxies, optimised for easy dispensing and fast, low-temperature curing. They provide maximum moisture protection, successfully meeting the requirements of JEDEC MSL 1, and have an operating temperature range of -60C to +180C.